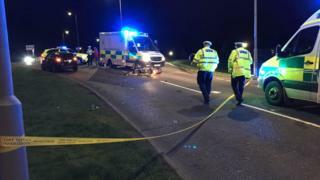 An 18-year-old man has been charged in connection with careless driving following a crash involving a car and a motorbike in Stirling on Thursday. Police said the 22-year-old female rider of the bike was taken to hospital with non life-threatening injuries. Emergency services were called to Back O Hill Road at about 19:30. The road was closed until about 21:20 to allow for a police investigation.